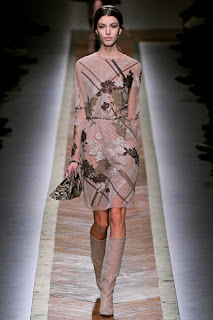 Making an entrance in Valentino makes an assured statement – beautiful, sleek and sophisticated to the hilt. And, like the gowns that bear the Valentino name, one would expect any perfume to deliver similar results. Wonderfully, Valentina does. This is a beautiful perfume. It’s become the norm these days to make mass market scents in vat fulls of over sweet clouds of pink so when a big, blowsy, delectable floral oriental radiating sweetness and light appears, it quite literally, makes a change. Master perfumers Oliver Cresp and Alberto Morillas have manged to capture the sophisticated femininity and charismatic beauty that is Valentino’s essence. This is like being wrapped in floral heaven – it’s warmth radiates big bundles of jasmine, Amalfi orange blossom and heady tuberose on top of the glorious sweet white Alba truffles and Calabrian bergamot. 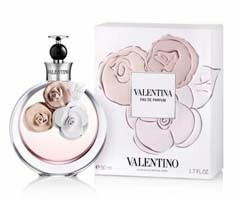 Like Valentino’s trademark intricate layers of white chiffon and organza, this perfume wraps the wearer up in feminine wiles, wooing everyone she comes into contact with. The beauty is in the balance – neither too sweet, nor too overpowering, this is a rush of much needed sophistication in an over crowded fragrance market. If I have one misgiving about Velntina, it’s the bottle: Yes its distinctive with it round flacon shape and its stick on typically Valentino flowers, however, these seem rather piecemeal and and afterthought, clumsily stuck on detracting from its sophisticated pitch, Ditto the black plastic spray nozzle which you have to blindly feel to ensure the spray is pointing in the right direction. It’s cleverness is in appealing to all ages – this perfume can easily be worn by a 25 year old as a 65 year old. It’s feminine appeal is sensual, alluring, overwhelmingly intense and memorable. I’d even suggest this is ideal for a ‘wedding’ fragrance for all those desperate for an apt choice for their ‘big day’, but what would I know? I prefer red carpet to church aisle but this would happily be apt for both. If worn alongside a gorgeous Valentino gown created by Creative Directors of Valentino, Maria Grazia Chiari and Pier Paolo, then we would be lucky girls indeed. Previous post: Lucy in Disguise celebrate their 1st Birthday with a New Store.